At 6:08 p.m. on Sept. 8, the cacophony of Kiev's Friday evening rush hour was pierced by an explosion under a black Toyota Camry in the middle of heavy traffic near Bessarabska Square in the heart of the capital. The car's driver, Timur Mahauri, a Chechen with Georgian citizenship, was killed instantly. His wife and their 10-year-old child who were riding with him were hurt, but they survived. Mahauri was reportedly a member of a Chechen militant group fighting with Ukrainian troops against separatist and Russian forces in eastern Ukraine. Media reports suggested that Chechen President Ramzan Kadyrov considered him an enemy. In addition to these two possible motives for his assassination, Kiev has recently become a hot spot for the assassination of Moscow's enemies, and opponents of the Chechen government are being killed in a worldwide campaign. Indeed, given Mahauri's enemies and location, it is surprising that he didn't check his car for bombs before he got into it. This case provides important lessons for others. As I've discussed elsewhere, Russia's intelligence agencies have a long history of involvement in assassinations, refered to by its intelligence officers as "wetwork" or "wet affairs." Indeed, they have pursued the enemies of the Russian government around the globe: Alexander Litvinenko was murdered in London in November 2006; and Mikhail Lesin died under mysterious circumstances in Washington, D.C., in November 2015. They are not the only examples. It should come as no surprise then that people considered to be enemies of the Kremlin — including opposition politician Boris Nemtsov — are being murdered in Russia itself as well as in adjacent countries. * Is China’s ‘Frontline State Strategy’ going out of Control or North Korea Crazy? When President Trump on taking over tried to outsource the problem of resolving North Korean Crisis to China presumably in exchange of some trade concessions, his administration overlooked the fact that China was part of the problem. The disappointment which his Administration suffered and expressed later was an expected outcome. 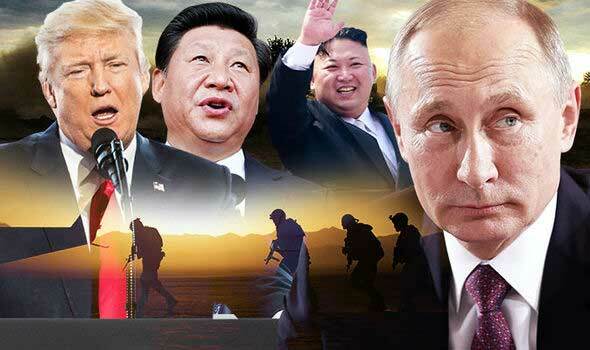 The Chinese Strategy of North Korea being used as a ‘Frontline State’ against US and its ally South Korea, dates back to Korean War of 1953, when China entered the War with an aim to avoid US/South Korea to be its neighbour, as a permanent continental military threat. This deep rooted strategy continued helping North Korea a militarily strong nuclear state with autocratic regime, making it a major global threat. The strategy is still applicable to the same extent, with China’s overt and covert support to North Korea involved in nuclear and missile test misadventures, posing a threat to its greatest competitors. This strategy now seems to become a liability with North Korea irresponsible actions post UN sanctions, and Beijing’s announcement that ‘If North Korea invades another country, China will not defend them’. In fact China has adopted this successful ‘Frontline State Strategy’ to Pakistan in a different, modified form by getting warm water connectivity to gulf with port facility. They have been able to buy over the strategic choices of Pakistan, by potentially getting them into long term debt trap. In this case also China reaps the fruits of Pakistan’s Kashmir fascination and keeping its regional competitor (India) engaged by ongoing export of terror by Pakistan, by continuously ignoring it. The worldwide criticism of Pakistan’s role in harboring terrorists, and China’s criticism of supporting an irresponsible regime sponsoring it has led to actions like condemning some Pakistan based terror groups in BRICS Summit, as a midcourse correction. The risk of propping up a semi autocratic power (Pakistan being a sham democracy, with autocratic power of Pakistan Army) having nuclear power is marred with uncontrollable risks, slightly similar to its Frontline State North Korea. It is appropriate and befitting, given his stature and distinctive profile, that the only Marshal of the Air Force (MAF), Arjan Singh, was accorded a state funeral with the national flag flown at half-mast. The MAF is the equivalent of a five-star Field Marshal (FM) in the army and India had earlier elevated only two officers to that rank – Sam ‘Bahadur’ Manekshaw and later ‘Kipper’ Cariappa. Air Chief Marshal Arjan Singh was elevated to Marshal of the Air Force in January 2002. 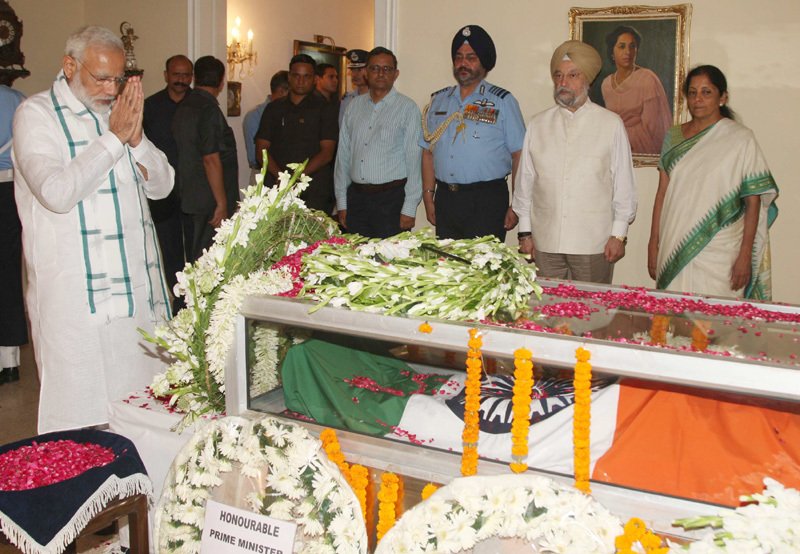 In an unprecedented but welcome gesture, the President and the Prime Minister led the country in paying tribute to an ‘icon’ – not just of the Indian Air Force, or the Indian military – but for the entire nation. Born in 1919, the MAF was just two years short of his ‘century’ and while his demise is indeed very sad, he lived a life that will remain an inspiration for a younger generation that can only glean some part of his professional trajectory from military history books and related documentation. The bare statistics about the MAF’s life are stupendous. Commissioned in the erstwhile Royal Indian Air Force in December 1939, he began life as a fighter-pilot in the earliest bi-planes of the time and was awarded for high gallantry with a DFC (Distinguished Flying Cross) during the Burma campaign in 1944. 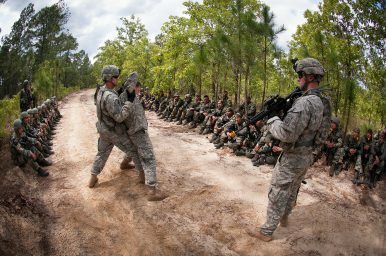 The Indian and U.S. armies have started the thirteenth iteration of their Yudh Abhyas series of joint military exercises. The exercise began on September 14 at Joint Base Lewis McChord in Washington state in the United States and will go on until September 27. The United States and India trade off on hosting iterations of the exercises. The first-ever drill under the Yudh Abhyas moniker was carried out in 2004 at the platoon level and has since been expanded. The exercise this year will focus primarily on the counter-terrorism operations and will also included strategic consultations between senior armed forces officers on both sides. Last year’s Yudh Abhyas was held in India, in the Chaubatia foothills in India’s state of Uttarakhand near the Sino-Indian border. Though the U.S. Department of Defense or Pacific Command has not publicly confirmed the exact scope of this year’s exercise, it is likely intended to focus on similar operations under a United Nations mandate. “Both sides will jointly train, plan and execute a series of well-developed tactical drills for neutralization of likely threats that may be encountered in UN peace keeping operations,” it added. A nation’s foreign policy is strongly influenced by the imperatives of its neighbourhood, its strategic environment and the perception of its own status in the international community. India’s extended neighbourhood, outlined in Kautilya’s ‘Arthashastra’, the ancient Indian treatise on statecraft, as one of widening concentric circles around a central axis of historical and cultural commonalities, is an appealing definition which is a rational mean of demonstrating India’s future great power status. India is proactively pursuing a vigorous bilateral and multilateral agenda, based on its national security templates, at a time when the world is facing many new global strategic challenges. What are these new challenges? To what extent have our decision makers in the making of foreign policy been successful in addressing them? The remarkable continuity in Indian foreign policy despite change of governments has some advantages, but also drawbacks. There are certain principles in our foreign policy which we are reluctant to shed even if the global scenario starkly demonstrates our need to move on and find new strategic paradigms. Non-alignment is one of them. We have never formally jettisoned non alignment. After the present government came to power, we have only sent our former Vice President to attend Non-Aligned Movement (NAM) summit meetings. This is a clear signal of our distancing ourselves from NAM. Today, our lip service to NAM makes a mockery of our continued membership. With the end of the Cold War, a new era of globalisation and, in an increasingly uni-polar world, India should have analysed and thought through its foreign policy and strategic directives based on its definition of strategic autonomy and its national security interests. New Mexico is quietly wild. Its multicolored sunsets, volcano-pocked terrain and unique cultural landscape attract tourists, inspire artists and mask its dark side. After all, one of the perks of the sparsely populated state is that it's wide-open spaces offer a makeshift sanctuary to those who seek isolation and freedom, but with that magnitude of freedom comes the danger of believing that the day-to-day social and legal restrictions that govern society no longer apply. Anything seems possible under the desert sun, and many people have gone out of their way to test that theory. Crime in the desert is like a flower on a cactus. It flourishes in unexpected places. It is not easily beaten back by brutal or unexpected elements. It does not shy away from the brink of extinction or the occasional danger. It is difficult to kill. This has sometimes been a harsh reality for the sprawling territories that are governed by the state’s twenty-three Indian tribes. New Mexico is no stranger to unusual crimes, so it is unlikely that authorities were shocked when they caught Loren Lloyd Wauneka and Lisa Benally stealing jewelry, furniture and firearms from a law-enforcement officer’s residence on the Navajo Nation reservation in January 2016. Both had criminal histories. Wauneka was convicted of the crime and sentenced to thirty-seven months in prison followed by three years of supervised release, according to an August 10 Department of Justice press statement. Benally is still awaiting her day in court. She faces ten years in federal prison. sense of strategic opportunity, rather than existential angst, in Iranian leaders’ imaginations. American forces could still be in Afghanistan sixteen years from now—or even generations from now—under the White House’s current strategy of maintaining an open-ended commitment to that war-torn nation. TIRANA, Albania — Even though President Trump announced his strategy for the war in Afghanistan in August, the Pentagon and NATO are still trying to map their way forward in the nearly 16-year-old conflict, according to U.S. officials. The delay is the byproduct of the U.S. commander’s vision for the war and the alliance’s ability to provide the troops required to make it a reality, according to a U.S. official who like others spoke on the condition of anonymity to discuss ongoing deliberations. In recent weeks, the United States deployed additional forces into Afghanistan — a move that coincided with the announcement of Trump’s strategy — to help bolster Afghan forces during the final months of this year’s fighting season. The immediate surge was a short-term solution, requested by battlefield commanders, but the Pentagon is still assessing how U.S. troops will be deployed in the country in 2018, according to a U.S. official in Afghanistan. Speaking to a small group of reporters, Gen. Curtis Scaparrotti, the head of the U.S. European Command and Supreme Allied Commander of Europe, said that he expects to have a “full picture” on NATO commitments by October. “There is still a lack of clarity which positions, which functions, to focus their contributions,” said Czech Gen. Petr Pavel, chairman of the NATO Military Committee. Speaking at a news conference here, Pavel added that the recently announced U.S. strategy provides a clearer picture of the way forward, but the alliance won’t make final troop decisions until another conference in October. China Pressuring Pakistan on Terrorism? President Donald Trump, in an announcement on the recent overhaul of U.S. strategy in Afghanistan, admonished Pakistan for sheltering “the same organizations that try every single day to kill our people” in the fight against the Taliban. Yet analysts have questioned whether Pakistan really needs to heed the United States’ call to “demonstrate its commitment to civilization, order, and to peace,” given the growing warmth of its relationship with China. Despite China being the first to rush to Pakistan’s side and denouncePresident Trump’s remarks, the declaration following the 2017 BRICS Summit held in Xiamen proved to be significant – it marked the first time Beijing agreed to condemn Pakistan-based terror groups like the Haqqani Network, Lashkar-e-Taiba (LeT), and Jaish-e-Mohammad (JeM), despite repeatedly blocking the United Nations Security Council from listing JeM leader Masood Azhar as a globally-designated terrorist in the last year. China’s diplomatic support for Pakistan at these critical moments prevented sanctions that could have had negative political and economic ramifications on Islamabad. At the time, India deemed China’s action at the international forum to be a confirmation of the “prevalence of double standards in the fight against terrorism.” So, what has changed? Despite public statements in support of Pakistan, China’s increasing economic stakes and evolving security concerns in the region seem to be forcing Beijing to reorient its internal calculus and tighten its grip over security in Pakistan. The Doklam issue stands resolved after a nearly 73-day standoff, at least for the time being. It has been a tremendous battle of nerves and resolve on part of the Indian Army’s to not only intervene in time, but hold on to their positions steadfastly and give adequate time until diplomatic parleys finally found a successful breakthrough. This has once again shifted focus back to India’s traditional adversary - Pakistan. Time and again, whenever there is a terrorist strike in J&K or elsewhere in the country, there are endless debates in the media, news papers get filled with all kinds of ideas on responses that must be galvanised into powerful actions in order to make Pakistan pay more for its misadventures against India which it routinely denies and stresses the activities as having been carried out by ‘non-state’ actors that they are never aware of. This hide and seek has been going on since the decade of the nineties more proactively, but at large for close to seven decades. Often enough, there has been a debate on the possibilities of a conventional war under the nuclear threshold. However, it is about time to debate and discuss Pakistan’s threshold of conventional response to India’s trans LoC raids that Delhi should decide to undertake at a time and place of its choosing the moment it is able to trace back its linkages of terrorists striking Indian territory that lead back to the Pakistan establishment or terrorist outfits based inside Pakistan. The latest trend in Pakistan is that these terrorists outfits are in the process of being ‘converted’ into a legitimate political force by forming political parties with stakes in governance making it even more difficult to detect and act against them. 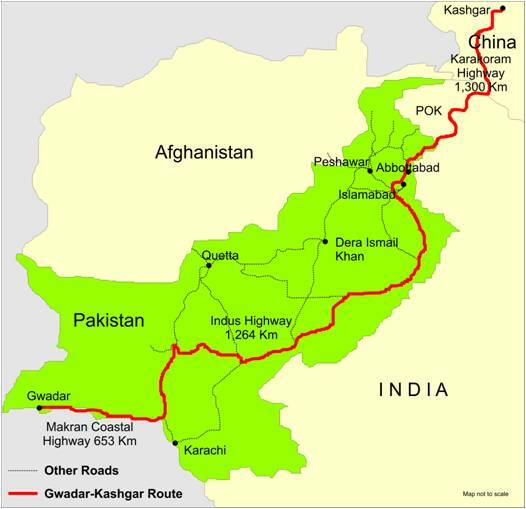 Will jihad kill China-Pakistan Economic Corridor!!! China and Pakistan have signed an Anti-Terror Cooperation Agreement devoted exclusively for China-Pakistan Economic Corridor (CPEC). The imperative being increasing threat to the CPEC from jihadi groups. The agreement was signed in Beijing after extensive talks between Meng Jianzhu, head of the Commission for Political and Legal Affairs of the Communist Party Central Committee with his Pakistani counterparts Foreign Minister Khawaja Asif and National Security Advisor, Nasser Khan Janjua. The timing of the visit by this Pakistani delegation assumed importance because it was in the wake of BRICS Summit, wherein Pakistan was indirectly castigated for harbouring terrorist groups and sponsoring terrorism. The agreement in a way reiterates China’s surprise position in BRICS on jihadi terror groups in Pakistan. It appears that these groups have begun to cause anxiety amongst the Chinese authorities with regard to the security of CPEC. It may also be mentioned that Pakistan has already deployed some 15,000 personnel, i.e. 9,000 army and 6,000 para-military, for the security of the CPEC. All jihadi tanzims are ultimately global jihadi organizations in orientation and treat Pakistan as merely a base. This anti-terror cooperation agreement exclusively for the CPEC is a tacit admission that many of the jihadi groups operating from Pakistani soil are against the project. All jihadi tanzims are ultimately global jihadi organizations in orientation and treat Pakistan as merely a base. It is the concept and mission of global jihad that the factories of jihad, i.e. Mosques and Madrasas relentlessly purvey,, invoking relevant suras of Quran. In the Quran, there is no mention of entity called Pakistan. Of course, there is indeed mention of Ghazwa-e-Hind, which prophesizes that the ultimate battle of Islam will be fought in the Indian Subcontinent. So, bereft of any mention in Quran, Pakistan has absolutely no Islamic sanctity in the scheme of global jihad. The jihadis are weaned on the idea of global jihad rather than Pakistan in their indoctrination. The strategic agenda of Pakistani State is only an adjunct of global jihad. As has been evident since the earliest forms of combat, exclusively conducting one method or way of war is rarely effective in the long term. Sustained victory requires an adaptable force that understands and adjusts to changing political, social and economic landscapes. This force does not need to be drawn only from national militaries, or provided by the UN or so-called “coalitions of the willing.” PSCs have been used effectively in the past to stop civil wars and to bring parties to the table in moves toward peace. Successful PSCs understood the physical terrain as well as the human terrain, something Erik Prince claims his warriors know from their years of experience in wars in Iraq, Afghanistan and other conflicts around the world. Where U.S. troops rotate every year to eighteen months, Prince says that if given the chance his forces will be there over the long term, and see the war to its conclusion. He contends that consistency of personnel and experience will make all the difference. In contrast, our current model of rotating soldiers (and leadership: seventeen commanders in sixteen years) through Afghanistan has not worked. When oil prices suddenly halved from over $100 a barrel in 2014, our IMF studyconcluded that supply-side factors such as the emergence of shale and new technologies would be a key force keeping oil prices “lower for longer." More recent studies suggest that other new technologies, such as the spread of electric cars and solar electricity generation, could even more profoundly affect the oil market and the long-term demand for oil. As Sheikh Zaki Yamani, a former Saudi oil minister, once said, “The stone age came to an end not for a lack of stones, and the oil age will end, but not for a lack of oil." The People’s Liberation Army Navy (PLA Navy) recently announced that the various naval flying and engineering schools in Yantai (Shandong) have been consolidated and elevated to the status of the “China PLA Navy Aviation University” [中国人民解放军海军航空大学]. For a rising power with grand naval ambitions that just launched its second aircraft carrier, the move to consolidate and upgrade its institutions for training naval pilots is not at all surprising. Even putting carrier aviation aside, Chinese aircraft development (both manned and unmanned) has been a veritable beehive of activity in the last decade, producing numerous sleek fighters and attack aircraft, transports, trainers, electronic warfare and early warning aircraft, not to mention a slew of UAVs and helicopters too. Moreover, rumors regarding a long-range bomber, as well as vertical takeoff and perhaps tilt-rotor aviation need to be taken seriously. In combination with China’s bristling conventional missile strike forces, these new air capabilities are slowly but surely altering the military balance in the Asia-Pacific region. Against that somewhat perturbing background, Beijing’s new large amphibious aircraft AG-600, which was first revealed at the Zhuhai airshow back in 2016, forms rather an anomaly since it is neither sleek, nor stealthy, nor bristling with weapons and sensors. Chinese sources readily admit (as discussed below) that the AG-600 falls short of the world’s leading designs for such aircraft. Deepening the mystery, moreover, is the fact that the U.S. Navy has not operated seaplanes of any type for decades, implying they are not cost-effective and have numerous operational limitations in modern naval warfare. So what exactly are Beijing’s planners thinking? Is this China’s “Spruce Goose”—the product of aircraft engineers run amok without strategic sense or fiscal constraints? Disputes in Asia, be they in the maritime or territorial spheres, are usually complex. Their nature or connotation may vary from issue to issue and from one sub-region to another and may have different sets of implications. Also, they tend to expand beyond their original context and become somewhat byzantine when they are connected with ‘national interests’, which involves both the quest for resource exploration and national pride. 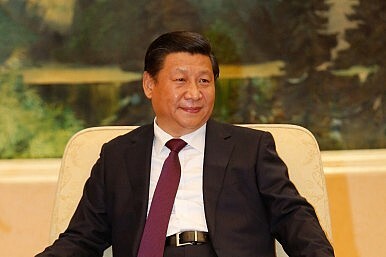 An assessment of China’s continued reservation on India’s oil and energy exploration in the South China Sea (SCS) and India’s concerns over China’s infrastructural development in Pakistan-Occupied Kashmir (POK) under the China-Pakistan Economic Corridor (CPEC) project – which is a vital part of Beijing’s ‘One Belt, One Road’ initiative – underline these complexities. Both oil exploration in the SCS and infrastructure development in the POK may be two different issues involving different sub-regions; but the Chinese and Indian approaches and reactions and their pursuit of ‘national interests’ in these matters compels the drawing of a parallel. This Policy Brief analyses the complexity introduced into India-China relations by these two issues as well as the resultant fallout. The assessment here indicates the irrationality of the Chinese approach to which India must respond cogently. All the more so when China has released the document, Vision and Actions on Jointly Building Silk Road Economic Belt and 21st Century Maritime Silk Road, in March 2015,11 and Beijing desires India to join and support its ‘One Belt, One Road’ initiative. China opposes India’s oil exploration in the SCS (which has been undertaken at Vietnam’s request) by calling the area of exploration a ‘disputed’ area and asserting ‘Chinese sovereignty’ over the SCS in the ‘historical’ context. It has been continuously expressing its reservation in this regard in the last few years, and sometimes quite belligerently at that. India has taken note of the Chinese reservation and has carefully gone ahead in signing a few agreements with Vietnam for oil exploration in the SCS. These exploration fields are very much within the maritime space under the actual control of Vietnam. At least twenty-nine people were injured when an improvised explosive device detonated on a London underground train during rush hour last week. None of those injuries is believed to be life-threatening. The device, though not a total dud, malfunctioned, failing to explode with the intended ferocity. The UK has—at least so far—caught a break. Two men have been arrested in connection with the attack. British interior minister Amber Rudd has said that there is no evidence that the Islamic State (ISIS) played a role in the attack, but ISIS has claimed credit for it. Investigators have assessed it to be “highly likely” that the bomb contained TATP: the explosive dubbed “Mother of Satan” and associated with recent ISIS operations. The use of explosives in the attack was unsurprising. Recently, those in the counterterrorism business have shifted more of their attention toward how terrorists are increasingly drawn to low-tech attacks that involve vehicles and knives. Yet my recent analysis, which encompasses all Islamist terror plots in Europe between January 2014 and May 2017, shows that explosives are still the most popular form of weapon for Islamists plotting in Europe. Explosives were the weapon of choice in 28 percent of these 142 plots. The good news is that only six of the plots led to injuries or deaths. After all, it is harder for terrorists to acquire suitable material, avoid detection and possess the level of expertise required to build the device. One reason it has proven so difficult to defeat terrorist organizations such as ISIS, al Qaeda and the Taliban is that they are free of the burden imposed by a stultifying acquisition bureaucracy. Terrorist organizations don’t have military academies, national laboratories, large aerospace and defense companies or massive treasuries. The absence of formal institutions and traditional ways of thinking may actually give these groups an advantage. In the U.S. military, a service can’t even begin to develop a new weapons system without a formal requirement, which can take several years to write. The acquisition process often takes twenty years or more before a new weapon system is deployed. ISIS has it easy: no contracting regulations, no lawyers or accountants, no office of operational test and evaluation, no GAO protests or court challenges to procurement decisions and definitely no Congressional oversight. Terrorist organizations acquire what is available, use the battlefield as their laboratory, tolerate mistakes, extol improvisation and keep trying. While they can’t build major weapons systems, they certainly know how to employ many of them. ISIS has happily incorporated captured armored fighting vehicles, artillery pieces, mortars and other weapons into its arsenals. More significantly, terrorists are extremely good at figuring out how to adapt readily available technologies for military purposes. The terrorists have made the term improvised explosive device (IED) part of the modern lexicon; the phrase is in the Oxford American Dictionary. But these three simple words belie the variety of such devices, the sophistication with which terrorist organizations have employed them and the implications for the future of counterinsurgency warfare. The IED threat nearly defeated the Coalition in Iraq during the early years of the campaign. More than 60 percent of Coalition casualties were inflicted by IEDs. The Pentagon set up a brand new organization, the Joint IED Defeat Organization (JIEDDO) and spent tens of billions of dollars on armored vehicles, bomb detectors, jamming devices and other force protection measures. As fast as the Coalition figured out means of defeating a particular type of IED, the terrorists changed the way they made, implanted and/or triggered their IEDs. At its peak, the Islamic State of Iraq and the Levant (ISIL) controlled vast portions of territory in Iraq and Syria with several million inhabitants. Unique amongst similar jihadist groups, the Islamic State's territorial ambition and desire to conduct state-like governance over this territory is integral to its global ideological appeal. A RAND project – not funded by an external sponsor, but pursued for the public interest – examined ISIL's governance over its self-styled caliphate, by examining the group's impact on local economic activity in Iraq and Syria. Using satellite imagery and a novel analytic approach, a team of RAND researchers developed a fine-grained, data-driven assessment of economic life inside ISIL's caliphate. This site tells the story. Although significant attention has been devoted to the humanitarian impact of ISIL’s brutal rule, this project focuses on the economic impact of the group’s efforts to govern the territory and population under its control. The Islamic State has proven a resilient insurgent force capable of controlling territory and administering local governance. At its peak, the Islamic State, also known as the Islamic State of Iraq and the Levant, or by the acronyms ISIL or ISIS, controlled vast portions of territory in Iraq and Syria. At times, ISIL was able to build a dense governing apparatus that helped maintain stable local commercial activity, particularly within its strategic capitals in Raqqah and Mosul. At other times, the group inadvertently mismanaged key resources or sought to punish its citizenry rather than govern it. Mix-and-match tanks are nothing new. The Nazis mounted captured Russian artillery pieces on looted Czechoslovakian tank chassis to create the Marder self-propelled antitank gun. The Israel Defense Forces put British tank cannon on American-made Pattons and American engines on British-made Centurions. But a surprising source of do-it-yourself armor has been Islamic State. ISIS has modified its arsenal of captured, mostly Soviet- and Russian-made armor to create some bizarre vehicles. The Oryx Blog, run by two Dutch military analysts, has put together a fascinating collection of information and photos of these homebrew vehicles. In Syria, ISIS created two workshops at Raqqa and Deir al-Zour. Among the handiwork of the Deir al-Zour group were BMP-1 infantry fighting vehicles with their turrets replaced by a rapid-fire ZU-23 antiaircraft gun (which presumably was deemed more useful than the BMP-1’s original seventy-three-millimeter cannon and Sagger antitank missile launcher). The thinly armored BMPs were also up-armored with sheet metal and slat armor (that looks like metal chain-link fencing) on the hull, and side skirts protecting the treads. Yet the BMP’s turret didn’t go to waste: some were mounted on the back of Toyota Land Cruisers. ISIS armorers also modified T-55 and T-62 tanks with homemade armor. And, in one case, very homemade: the Oryx Blog points to a photo of a T-62 with a frame that apparently braces some sort of foam armor. “Certainly a curious choice for increasing your armor protection,” the blog adds. How effective is Islamic State governance? At its peak, the Islamic State of Iraq and the Levant (ISIL) controlled vast portions of territory in Iraq and Syria with several million inhabitants. ISIL's territorial ambition and desire to conduct state-like governance over this territory are integral to its global ideological appeal. By examining ISIL's impact on local economic activity in Iraq and Syria, this report seeks to assess the effectiveness of ISIL's governance over its self-styled caliphate. At times, ISIL was able to build a dense governing apparatus that helped maintain stable local commercial activity, particularly in its strategic capitals in Raqqah and Mosul. At other times, ISIL mismanaged key resources or sought to punish its citizenry rather than govern it. However, this report suggests that decaying economic conditions in ISIL-held territory are also a product of ISIL's inability to insulate its territory from opposing military forces. Outside pressure against ISIL successfully prevented the group from realizing its governing ambitions across significant parts of its caliphate, with major consequences for its ability to support functioning local economies. This report is important for those trying to understand the group's impact on local populations in Iraq and Syria, for those seeking to counter its financing or conduct post-conflict stabilization, and for broader efforts to understand the economic impact of insurgent governance. MOSCOW (Reuters) - Russia’s Defence Ministry on Sunday rejected allegations it had bombed U.S.-backed militias in Syria, saying its planes only targeted Islamic State militants and that it had warned the United States well in advance of its operational plans. U.S.-backed militias said they came under attack on Saturday from Russian jets and Syrian government forces in Deir al-Zor province, a flashpoint in an increasingly complex battlefield. The Syrian Democratic Forces (SDF), an alliance of Kurdish and Arab militias fighting with the U.S.-led coalition, said six of its fighters had been wounded in the strike. But Major-General Igor Konashenkov, a spokesman for the Russian Defence Ministry, dismissed the allegations in a statement on Sunday. Konashenkov said Russian planes had only carried out carefully targeted strikes in the area based upon information that had been confirmed from multiple sources. The strikes had only hit targets in areas under the control of Islamic State, he said. “To avoid unnecessary escalation, the commanders of Russian forces in Syria used an existing communications channel to inform our American partners in good time about the borders of our military operation in Deir al-Zor,” Konashenkov said. “In the last few days, Russian surveillance and reconnaissance did not detect a single clash between Islamic State and armed representatives of any ‘third force’ on the eastern bank of the Euphrates,” he added. Separately, Franz Klintsevich, a member of the upper house of parliament’s security committee, said there was no proof to underpin the accusations against Moscow. BAGHDAD (AP) — Turkish nationals make up half of the hundreds of families being held in a camp near Mosul for suspected links to the Islamic State group, Iraqi Prime Minister Haider al-Abadi said in an exclusive interview with The Associated Press Saturday. The Iraqi leader also confirmed that the German teenage girl found in Mosul last month is still being held in a Baghdad prison and may face the death penalty. At the camp near Mosul, Iraqi forces are holding 1,333 women and children who surrendered to Kurdish forces. The families handed themselves over after an Iraqi offensive drove the extremist group from the northern town of Tal Afar, near Mosul at the end of August. So far, al-Abadi said, Iraq has repatriated fewer than 100 people. “But we are working very hard to accelerate this. It is not in our interest to keep families and children inside our country when their countries are prepared to take them,” he added. Sixteen-year-old Linda W. ran away last summer from her hometown of Pulsnitz in eastern Germany after communicating with extremists from the Islamic State group online. She was found in the basement of a home in Mosul’s Old City by Iraqi forces, arrested and brought to Baghdad. Iraqi intelligence officials told the AP the girl allegedly worked with the IS group’s police force.